Bonnae Gokson’s book Butterflies and All Things Sweet opens a window into the inspiration and ideas behind her extraordinary cake designs. 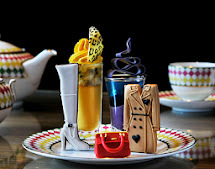 Unique in the world, these cakes encapsulate the creative vision of the woman who made her name working with luxury brands including Chanel, Giorgio Armani, W Hotels and Ritz Carlton. 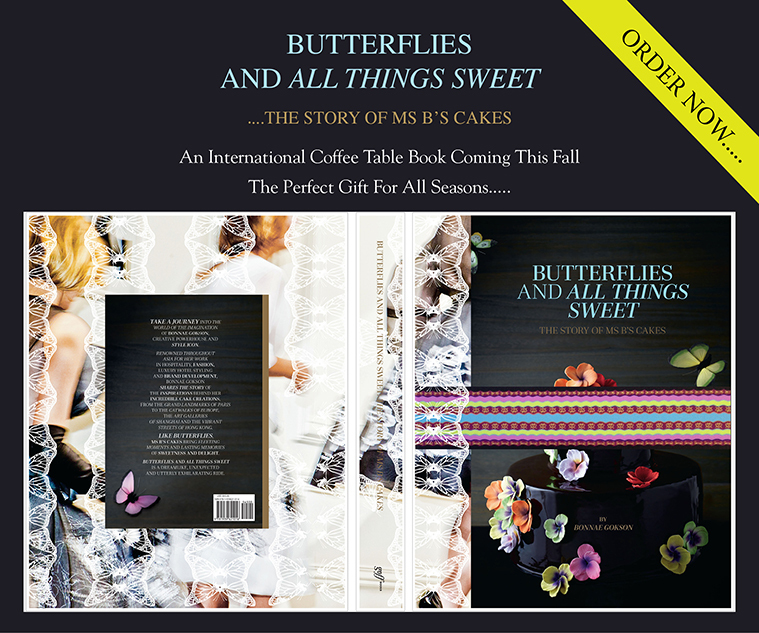 Butterflies and All Things Sweet is not a cookbook, but a visual feast, exploring the ingredients, ideas and inspiration behind the works of edible art through lush photography shot on location in Hong Kong—the home of Bonnae Gokson’s cafes and restaurants—and internationally. The ruffles of a petticoat. The petals of a delicate peony. Rolls and rolls of satin ribbons in a dozen shades of red. The startling purple hue of taro at the market. The juicy citrus cells of a pomelo, the jewel-like seeds of a pomegranate. Fragrant ripe raspberries at the height of their perfection. The gold luster of a butterfly’s wing, glimpsed and then gone. “When there’s a lot going on, it is the simple things in life that are the most powerful,” she says. Bonnae Gokson’s privileged upbringing exposed her to fine dining, grand entertaining and extensive international travel, and these influences shaped her destiny as the Hong Kong style icon she is today. Yet it is her quest for authenticity and joy that drives her creativity, resulting in cakes that taste as extraordinary as they look. “A little flour, a little sugar, a little butter and the power of the imagination: that’s what it takes,” she says. From pure raw ingredients to the last bite, when all that remains is a few crumbs on a hand-painted porcelain plate, each cake is a celebration of all that is sweet and transient in life itself. Bonnae Gokson’s Hong Kong cafes and restaurants include Ms B’s Cakery, Sevva and C’est La B.
is this out? I want it! Its is, you can get it on Amazon!